Last Friday, at the pretentiously-named-with-a-comma-even “The Quail, a Motorsports Gathering” event in Monterey, California, Hennessey Performance Engineering unveiled the engine that will power its new flagship supercar, the Venom F5. HPE claims the engine is a “newly developed unit,” and that the engine is entirely “bespoke” and the result of at least a year and a half of development. I’m not so sure how I feel about that. The engine certainly sounds impressive: we’ve been told by Hennessey that it should be making about 1,600 horsepower and 1,300 lb-ft of torque, which would absolutely put it in the same class the the Koenigsegg Regera and the Bugatti Chiron, cars the Venom F5 has been compared to since the very beginning. While as recently as March of this year John Hennessey himself was describing the engine as a “a completely bespoke, 8.0-liter twin-turbo V8” the engine shown at the Quail was just a touch smaller, a 7.6-liter V8, but it did have a pair of truly massive turbochargers. The engine seems like an impressive powerplant, no question. I even like the yellow valve covers. What’s puzzling me about the engine is how familiar it seems, especially for something that HPE claims is entirely their own “bespoke” design. It looks familiar because it sure seems like a billet GM LS engine, made with parts anyone (well, anyone with enough cash to spend) could buy online. Now, before I go into the details of exactly what is going on with this engine, I need to explain that there’s a reason our guard was up when it comes to Hennessey. It is a tiny shop that we have seen with out own eyes. A bespoke engine is a wild claim from the little outpost in Texas. 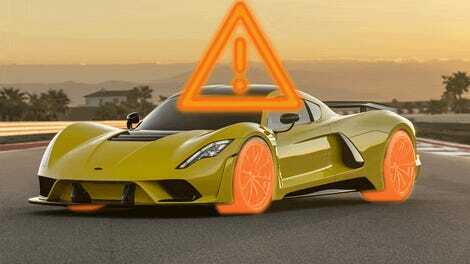 Moreover time and time again we at Jalopnik get word that things aren’t exactly as they seem at Hennessey. One Reddit thread blew up a few years back saying that Hennessey’s “Tuner School” was a complete ripoff. Then a year later ex-employees detailed that the business itself is a bigger mess than you’d imagine with cars (particularly for foreign clients) never being built, or parts from one build getting syphoned off for another being the most outstanding claims. And all of this is on the back of disputes that Hennessey had in the late 1990s into the 2000s, problems which were supposed to be behind John and his company. And even beyond that, Hennessey himself hedged his initial claims that the Venom F5 would do 300 miles per hour after being pressed on the issue. As for the engine, I wasn’t the only one who thought that something looked oddly familiar; our contributor Bozi Tatrarevic was thinking along these same lines, and helped me take a detailed look at the engine, and helped to identify a number of the parts that make it up. So, without coming out and saying exactly what this engine is or isn’t, let’s take a deep look at what it, at least, appears to be. Our own Raph was there at the event, and took this close-up shot for us, though this is also visible in the released press pictures of the engine. That lightning-bolt thing there is the logo of Australian race engine builder Noonan Race Engineer, which also has a manufacturing facility in South Carolina. Noonan sells a 462 cubic inch all-billet LS block they call the LS-Edge. Do a quick bit of math and you’ll find that 462 cubic inches comes to 7.57 liters, or, you know, you could round that up to 7.6 liters. The F5 engine sure looks like that block—the timing cover matches, even, though it does look like they took out the water pump and put a cover plate over the mounting hole. 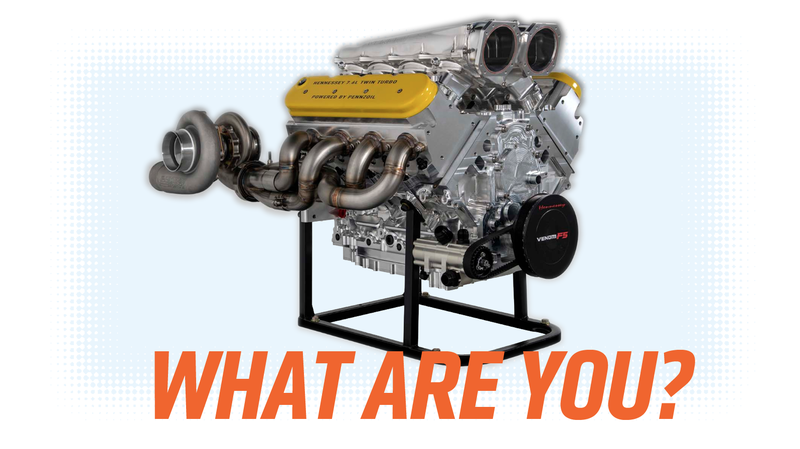 You can see examples of other very powerful race engines built with this block online—racers are using these blocks to make some insane 2,500 horsepower beasts. I reached out to Noonan to ask about this, but I was not given any definitive answer as to whether or not this block was one of their stock LS-Edge blocks with some logos milled into it, or a totally unique, non-LS HPE design they were contracted to make. The cylinder heads look a lot like polished GM LS7 ones. The dry sump oil pump and pan look to be from Dailey Engineering. The damper out front looks like an ATI Super Damper with a Hennessey sticker on it, the intake manifold looks to be one from Late Model Engines, and that valley cover is also a Noonan part, which you can see in pictures of this billet-Noonan LS engine-powered car. We brought all of this up with Hennessey, asking if that was a Noonan block as we suspected. Hennessey did agree that it was, and that Noonan was just one of its partners, and that Hennessey would be happy to release more information about its partners if that is what people wanted. Several hours after that conversation Hennessey posted a thank you to Instagram, citing both Noonan and Late Model Engines as partners, along with others like Motec, which does engine management and Forgeline, which makes wheels. Again, we reached out once more to Hennessey to ask if the Noonan block is an off-the-shelf order or if it was built to custom specifications. Hennessey claimed that “they’re not off the shelf parts,” but did not offer any explanation as to what is different or how when reached again for multiple requests for comment. If this engine has a year and a half of custom development in it, where can we see that, exactly? What we’re saying here is that the Venom F5's “bespoke” engine with (as people at Hennessey’s stand at the Quail told our reporter) a design that’s all Hennessey, sure looks like an LS engine, the kind that race shops have been building on a routine basis. Again, this is not to say that’s a bad thing! The contrary may be true, even. A proven engine design like the LS, with a vast and well-supported community and parts marketplace would provide supercar-level power with decidedly un-supercar levels of parts, ease of maintenance, and support. And even with its Noonan block and other associated parts, this is no normal LS. It’s not like Hennessey grabbed something out of a junkyard. Milling an LS up to 7.6 liters and then twin-turbo’ing it would just blow the whole thing to smithereens anyway. Even taking everything at face value, it’s a seriously impressive powerplant. So, if this is in fact the case, I find it puzzling why HPE would insist it’s their own unique design instead of embracing the fact that their supercar will use a race-proven engine design like a billet small block with the works? Look, maybe there’s some unique magic happening inside that lovely billet aluminum case. Maybe there’s piston heads with a grid of pyramids like a meat tenderizer, or there’s hydropneumatic piston rods that can capture and release energy at absolute optimum times, or some other manner of mechanical magic. Or, maybe, this engine actually isn’t a bespoke design representing a year and a half or more of research and development, and is actually just a very expensive race engine built from parts anyone could order online. While perhaps one could argue that the selecting of particular parts and combining them is enough to make a “bespoke” engine, we were initially told by HPE reps at the Quail that the engine was not LS-based, though they did incorporate lessons learned from working with Chevy small block/LS engines for years. This was before John Hennessey himself agreed with us when we said that the block came from Noonan. I don’t normally think an engine made from readily available race engine parts, the kind of engine that race shops produce every day, can count as a “totally bespoke” engine, and HPE reps telling us it’s not LS-based sure seems to imply it’s a whole engine design unique to Hennessey. If that’s the case, then is the engine I specced out and ordered for my old Beetle a “totally bespoke” design, too? I never really would have thought of it that way. To be fair, though, those headers are clearly custom, though, and they are quite lovely.